The Scotch egg recipe I first learned as a schoolgirl fell out of favour in recent years, I am guessing because the one I was taught was heavily breaded and then deep-fried. 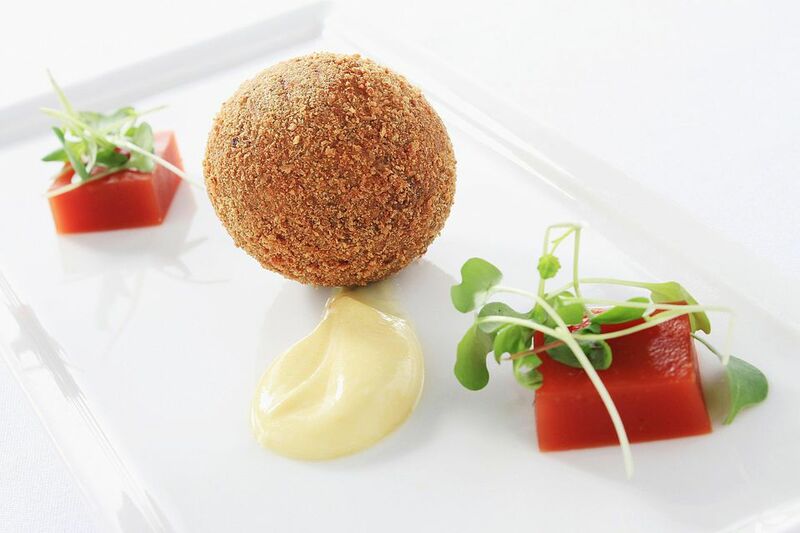 The 21st century Scotch egg, however, is lighter, uses free-range eggs, good quality sausage meat, fresh herbs and light crumbs for the coating and is only lightly fried, then baked in the oven. I for one am glad to see it back. Scotch eggs are a neat, portable, self-contained parcel of food, the only other so handy is the Cornish Pasty and both of which are perfect in a lunch box, at a summer picnic, a party or as a snack. Place the eggs in a pan of boiling water and cook for exactly 7 minutes. Remove from the pan and plunge into iced water to stop them cooking. Once cool, peel the eggs and put to one side. Dust the hard boiled eggs by rolling them in the seasoned flour. Place the sausage meat in a large bowl, add the Worcestershire sauce, spring onions, fresh herbs and mace, if using, and season with salt and pepper. Mix thoroughly. Divide the sausage meat into 4 equal portions. Form each portion into a flat cake large enough to fit around the egg. Work the sausage meat around the egg as evenly as possible whilst working hard to keep the egg shape and making sure there are no cracks. Place the meat coated eggs in the fridge for 15 minutes. Roll the boiled eggs in the seasoned flour followed by the beaten egg, then into the crumbs and press lightly to ensure a good 'fix'. Heat 4cm / 1 ½" of oil in a deep frying pan. Heat the oil to 180°C / 350°F (or until a cube of bread turns golden brown) in less than a minute. Place the coated eggs in the oil, raise the heat slightly and cook the eggs, turning frequently for 3 minutes. Remove the eggs and then place on a tray and pop into the preheated oven for 6 minutes or until golden brown all over. Drain on kitchen paper and serve warm or cool if for a picnic or lunch box. Scotch eggs can be made the day before and kept in the fridge.